My name is Douglas Chamberlain. 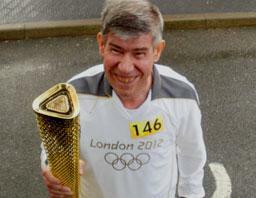 I have lots of hobbies and, recently, I was lucky enough to carry the Olympic torch through West Bromwich. I live in Coventry with my mum Hazel, my brother, Stephen, and my sister, Helen. I have another sister called Linda and she lives nearby with her husband, Steve, and their children, Martin and Craig. One of my hobbies is doing jigsaw puzzles. I especially like ones with pictures of flowers on. The most pieces I have done is 1000 – it took more than a week to finish. I also like swimming. I’m a good swimmer and can swim more than 50 lengths. I’m a keen fisherman and I catch carp, perch and bream. You have to be really patient and sit until they start biting. Once you see them starting to bite, you have to ‘pull up and strike’ and then reel them in. My dad used to take me fishing but I lost my dad. He used to take me every Sunday, and sometimes on weeknights as well. I really like gardening. When I am well, I work at King’s Hill Nursery – I really like plants and flowers. I can’t work there at the moment, because I am recovering from bowel cancer. In November, I had to have a major operation. Now I am on radiotherapy and chemotherapy. I haven’t noticed any side effects, but sometimes I feel quite bored because I can’t go out and about. Luckily my family are good at cheering me up. Another thing that really cheered me up was being asked to carry the Olympic torch. I go to two groups at Coventry Mencap, including the Wayfarers group. They nominated me and made it all happen. Coventry Mencap sorted out a coach, and me and my family and friends all travelled together to West Bromwich. A lady called Marion supported me for the day. She is one of the volunteers from Wayfarers. When we got there, we got another coach with all the torchbearers. I wore a lovely white suit and trainers (I didn’t wear the hat though). We were allowed to keep them afterwards and I got to keep the torch too! 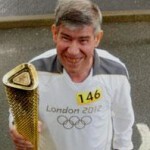 Mencap helped me with the money, so I could buy my torch – I will treasure it. I walked with the torch and Marion walked with me. My family were in the crowd – they were happy and taking lots of photos. There were other people in the crowds taking photos too and waving. I felt comfortable carrying the torch. I met a man called Matthew. He was the next person to carry the torch after me, so I lit his torch for him (pictured right). We had met on the coach. We sat down and started talking. I said, “my name’s Dougie” and he said, “my name is Matthew”. I really enjoyed the day. Now, when I look at the photos it brings back all the memories.